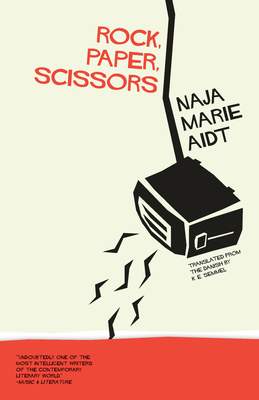 Naja Marie Aidt's long-awaited first novel is a breathtaking page-turner and complex portrait of a man whose life slowly devolves into one of violence and jealousy. Rock, Paper, Scissors opens shortly after the death of Thomas and Jenny's criminal father. While trying to fix a toaster that he left behind, Thomas discovers a secret, setting into motion a series of events leading to the dissolution of his life, and plunging him into a dark, shadowy underworld of violence and betrayal. A gripping story written with a poet's sensibility and attention to language, Rock, Paper, Scissors showcases all of Aidt's gifts and will greatly expand the readership for one of Denmark's most decorated and beloved writers. Naja Marie Aidt was born in Greenland and raised in Copenhagen. She is the author of seven collections of poetry and five short story collections, including Baboon (Two Lines Press), which received the Nordic Council's Literature Prize and the Danish Critics Prize for Literature. Rock, Paper, Scissors is her first novel. K. E. Semmel is a writer and translator whose work has appeared in Ontario Review, the Washington Post, and elsewhere. His translations include books by Karin Fossum, Erik Valeur, Jussi Adler-Olsen, and Simon Fruelund. Naja Marie Aidt was born in Greenland and raised in Copenhagen. She is the author of seven collections of poetry and five short story collections, including Baboon (Two Lines Press), which received the Nordic Council's Literature Prize and the Danish Critics Prize for Literature. Rock, Paper, Scissors is her first novel.K.E. Semmel is a writer and translator whose work has appeared in Ontario Review, the Washington Post, Aufgabe, The Brooklyn Review, The Bitter Oleander, and elsewhere. His translations include books by Karin Fossum, Erik Valeur, and Simon Fruelund.